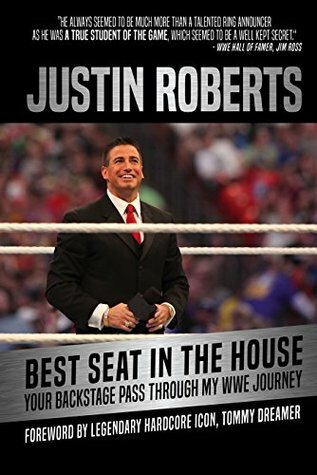 Former WWE ring announcer Justin Roberts recounts the story of his life and his time working for the biggest wrestling company in the world. Justin worked for WWE sporadically for years before finally securing a full-time announce gig as the voice of the ECW brand. From there, he worked his way up to Smackdown and eventually the flagship program, Monday Night Raw. Roberts discusses the highs and the seemingly endless lows of working for the world’s biggest wrestling organization. Above all else, Best Seat in the House is a heartbreaking read. Justin’s endless passion for the wrestling business is second-to-none. The amount of effort and drive to do what he did just to get his foot in the door of McMahon’s monopolistic company is astounding. Once he got in, he quickly found out that working for WWE, while it may be a dream job for some, is unbelievably stressful. Not only do you have to exist inside an archaic hazing style environment, but you also need to work within a disorganized mess under the direction of an erratic and often irrational boss in Vince McMahon. Obviously the WWE machine would not exist today if not for the tireless work by the company’s head-honcho McMahon, but judging by Justin’s memoir, Vince seems to expect everyone to either work just as hard as him (which in my opinion, is not fair), or be mind-readers. Last year, WWE was under fire due to a report that alleged tenured performer JBL (John “Bradshaw” Layfield) relentlessly bullied play-by-play commentator Mauro Ranallo to the point where he left his position. Mauro, well known to suffer from bipolar disorder, luckily found a spot away from JBL under the umbrella of the NXT brand. While JBL, Mauro and WWE deny that the story was true, it’s not hard to believe its validity. In this book, Roberts goes into extensive detail about how he was treated by Layfield through excessive humiliation and constant mental abuse. What is even worse is that this type of behaviour is encouraged. While pranks (or “ribs”) have always been a part of the wrestling industry, telling someone to “kill themselves” or stealing their passport causing them to miss shows is crossing a line. I know professional wrestling already doesn’t have the best reputation, but hearing about garbage like this will always keep it from truly penetrating the mainstream. Luckily, through the power of social media, word of this type of mistreatment travels quickly. Does it always work? No. However, at least this type of behaviour isn’t so easily buried. The Best Seat in the House was more or less, a good read. There are some compelling stories about his time on the road and his role in helping WWE connect with Connor Michalek, an eight year old boy suffering from pediatric cancer. I found that a few of the stories tended to feel a bit repetitive near the end which had me skipping through the book a little during the last 10%. I think Justin’s story is an important one as he was neither considered an “employee” nor was he viewed as “talent”, so despite having an integral role in the company, he was often overlooked for promotions, raises or recognition and constantly undervalued. It’s really too bad, because he’s one of my all time favorite ring announcers.